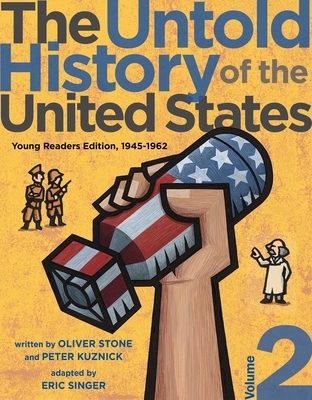 Rediscover pivotal moments in America’s past in this second volume of the young reader’s edition of The Untold History of the United States, from Academy Award–winning director Oliver Stone and Peter Kuznick. There is history as we know it. And there is history we should have known. Complete with poignant photos and little-known but vitally important stories, this second of four volumes traces how people around the world responded to the United States’s rise as a superpower from the end of World War II through an increasingly tense Cold War and, eventually, to the brink of nuclear annihilation during the Cuban Missile Crisis. This is not the kind of history taught in schools or normally presented on television or in popular movies. This riveting young readers volume challenges prevailing orthodoxies to reveal uncomfortable realities about the US role in heightening Cold War tensions. It also humanizes the experiences of diverse people, at home and abroad, who yearned for a more just, equal, and compassionate world. This volume will come as a breath of fresh air for students, teachers, and budding young historians hungry for different perspectives—which makes it a crucial counterpoint to today’s history textbooks. Adapted by high school and university educator Eric S. Singer from the bestselling book and companion to the documentary The Untold History of the United States by Academy Award–winning director Oliver Stone and renowned historian Peter Kuznick, this volume gives young readers a powerful and provocative look at the US role in the Cold War. It also provides a blueprint for those concerned with shaping a better and more equitable future for people across the world. Eric S. Singer is a high school and university educator. He holds an MEd in curriculum and instruction and a PhD in United States history, and served as the principal researcher for The Untold History of the United States documentary series and companion book. He lives near Washington, DC, with his wife and daughter. "Detailed, ambitious, and opinionated, this engaging narrative lays out a view of U.S. history often overlooked in standard texts and deserves a place on most library shelves."